It’s not difficult to see why people are all praises for this oasis in the middle of the city. First, the hotel’s service. The hotel’s staff is without a doubt their best asset. Everyone made sure that the guests are well taken care of. For example, my room was listed to have two double beds. Through email, I requested for a king-sized bed. I was told that the request will be noted though rooms with a king-sized bed were unavailable. Lo and behold, when I opened my room, I saw that I got what I wanted. Speaking of the room, it was great. Elegant and tasteful best describe how the room was. No tacky bits and pieces at all! The bed was very comfortable which ensured good rest. The room also had a spacious desk where I did most of my work after the training. The bathroom was okay. 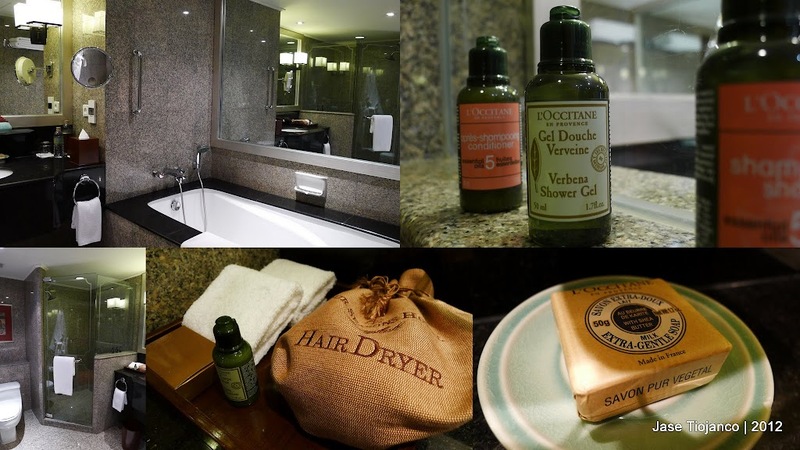 Their toiletries are L’Occitane which I like very much. I was a little surprised though that they don’t provide toothpaste and shaving cream, I had to go to 7-Eleven to purchase those. The shower’s a hit-and-miss affair as well. Even if you put the temperature on cold, the water would still be very hot. Also, there was no spray beside the toilet. One thing that would catch your attention when inside the hotel is the fact that Thai art can be found in almost every corner. The moment you step into the hotel, the grand staircase with a huge Thai painting would greet you. 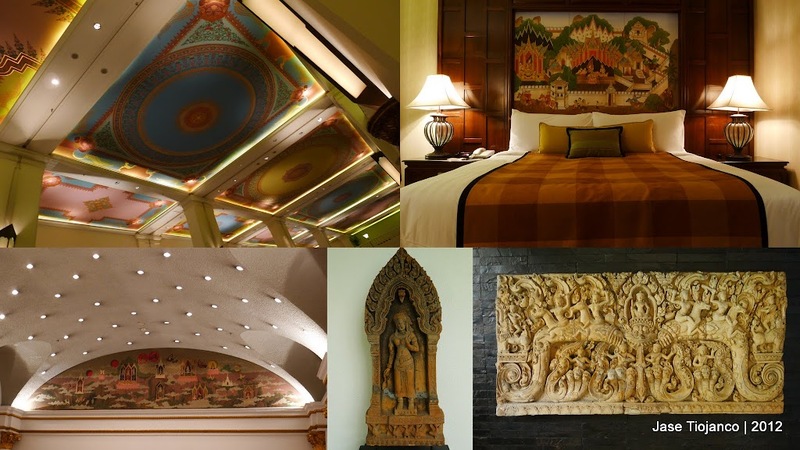 The ceiling of the beautiful lobby features Thai art as well. I really loved how they incorporated Thai culture in the hotel’s interior design. The hotel’s perfect for relaxation. One can easily find a tranquil spot in Four Seasons. 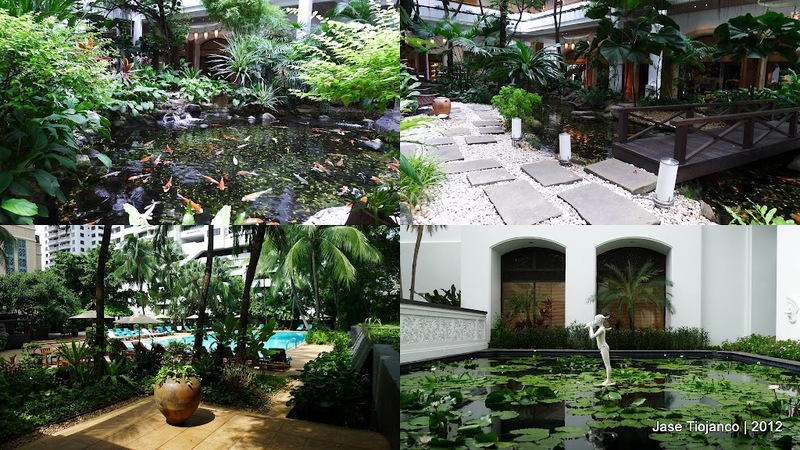 I particularly liked the pond near the Spice Market, one of the hotel’s many restaurants. Watching Koi fishes swim around was something that I found soothing. If I had to nitpick on something about the hotel, it would have to be their fitness center. Most of the equipment there are for cardiovascular exercises. Then again, it’s quite common that hotel gyms are not that good. On a positive note, the gym staff were fantastic. The moment I arrived there, I was offered fresh orange juice. I was also given a bottle of water and a towel. If you’re visiting Bangkok whether for leisure or business, give Four Seasons Hotel and Resort Bangkok a try. It’s a beautiful hotel conveniently located in the middle of Bangkok’s commercial district. Going around is pretty easy since the Ratchadamri BTS Station is just a stone’s throw away from the hotel.